How to modify this toy gun? The Steampunk Forum at Brass Goggles > General Steampunk > Tactile > How To... (Moderator: von Corax) > How to modify this toy gun? I might add some brass filigree on the stock and try to add a scope. I might also try stripping the paint on the stock, but I'm m not sure how to approach that. Other that, I'm not sure where I should go from there. I appreciate any suggestions. Thank you! Re: How to modify this toy gun? Honestly, it isn't much to work with. 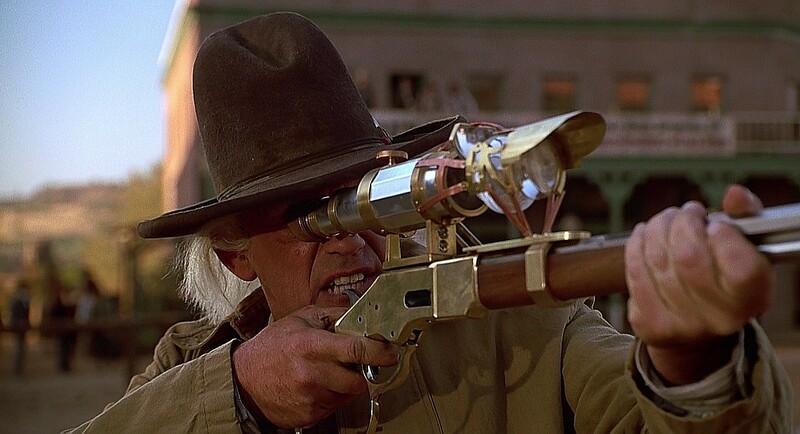 You might add a brass telescope sight like Doc Brown had in Back to the Future 3. I wouldn't do anything with the stock since you haven't time for anything you do to dry properly before your event. I like the idea of adding a killer accessory to the gun like the scope posted above by RJBowmen. Also, I'd add a sling of some sort to carry the gun around with you unless you want to hold it the whole time or leave it behind? Funny enough, that Doc Brown gun is what I was thinking of trying to imitate when I said I might add a scope! I'll definitely try that out. I might also paint some of the silver parts to match the paint of the scope. I will definitely add a sling. Somehow that hadn't even occurred to me. Thanks guys! Plastic trumpet or brass taxi horn on the barrel. Make a blunderbuss thing. "Don't be silly. He wouldn't write,"Aaarrgghhh!" is the stock plastic or wood? if the woodgrain is molded into plastic or rough enough in the wood that you can feel it dragging your fingernail across it, then you can simply rub some black shoe polish paste into the woodgrain. buffing it with a rag rolled into a hard ball will remove the polish from the high spots and leave the grain dark. even the bright metal sides can be done this way. its not permanent in any way but it holds up fairly well, and can be touched up at any time. a scope like the old fashion long tube type could be made up from a long piece of copper pipe and a reducing coupler for the eye piece. get two brass saddle type pipe hangers and bolt them to the top of the barrel so the scope can be held in them, you don't even need to joint the coupler to the pipe if the saddles hold onto the two pieces.